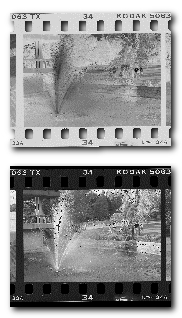 Using no filter, make a test strip and then a print of this negative making this clear strip just go black like we do with a "proper proof"
Repeat using a number 3 filter and then a number 1 filter. 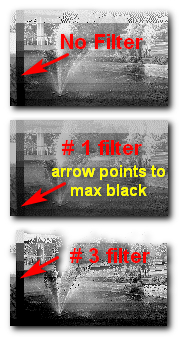 Your exposure times will change (longer) when using a filter (open the lens up if necessary). A new test strip is required every time you change contrast. Make your test stripl like this- include the clear stripe in each step- expose so that you have a range of tones from too light to too dark - pick the time where the stripe goes black for your exposure time of the print. You need a new test strip for each filter. The filter holds back light so you might have to open the lens aperture (f/stop). You will end up with three prints, one normal, one high contrast, one low contrast. The Black stripe should be the same density in each print. 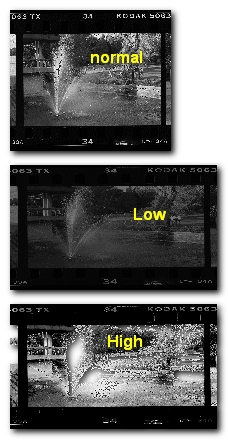 Note how the change in contrast affects the tonality in the highlight and midtone areas of your print.